Surrey’s independent estate agent, Seymours, has been awarded the prestigious Estate Agency Member of the Year Award at this year’s Awards Ceremony of The Guild of Professional Estate Agents. 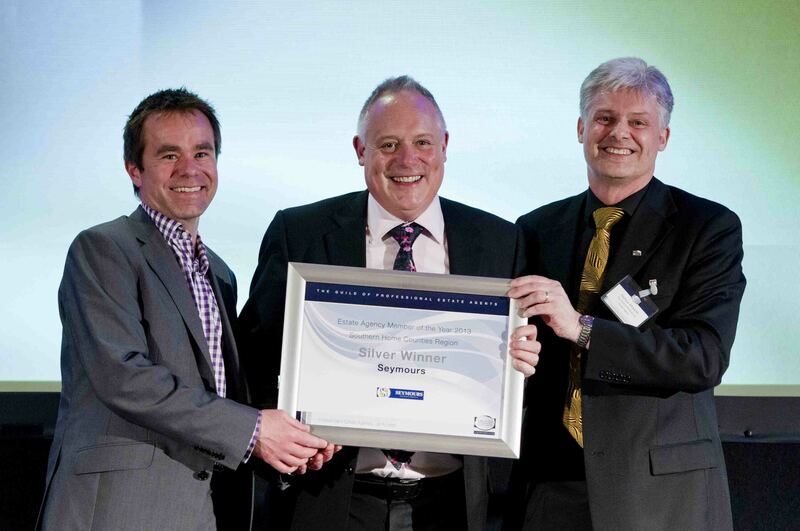 Paul Rickard and Richard Stovold, partners at the Guildford and Burpham offices, accepted the Award for the Southern Counties Region at the Millennium Hotel in Grosvenor Square, London, in front of an audience of over 700 fellow Guild members – all of whom were vying for a national award. The Award was presented to Seymours for upholding excellence across the estate agency industry, demonstrating a commitment to continual professional development for its employees and using innovative approaches to marketing. The Guild appoints only one estate agent for each town, which means that in each of the areas where Seymours has a presence, The Guild has identified them as the best. Seymours has significantly expanded over the last four years and plans to grow a further 50 per cent by the end of 2014. For more information visit www.seymours-estates.co.uk or www.guildproperty.co.uk.